In 2011, I read a most unique (at that time) picture book—Herve Tullet’s Press Here. My guess is that most of you are now familiar with the book, but in case you are not: Tullet created an interactive story where the author instructs the child to press a yellow dot which appears to affect when happens after the page turn. Thanks to the child’s directed actions, the dot multiplies, changes colors, moves around the page, and grows. Meanwhile, the child gets a chance to tap, rub, tilt, and blow on the book. I though the book was brilliant. In a way, it mimicked interacting with a tablet while still giving the child an experience with a book. I was so delighted with Press Here that I purchased multiple copies that holiday season and gave it to every toddler and preschooler I know. Several relatives of these kids told me it became their favorite book. Those children are now 11 years old…and in the years since I have can across more and more books using these techniques. Tullet has written several others (shout out to Mix It Up, focusing on color mixing). 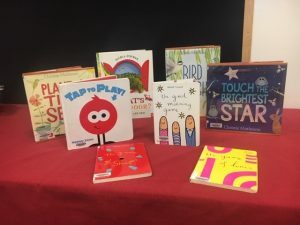 Christie Matheson has authored many such books, such as Tap the Magic Tree (the seasons), Plant the Tiny Seed, and Touch the Brightest Star. Jessica Young’s Play This Book and Pet This Book, Salina Yoon’s Tap to Play, What’s Next Door by Nicola O’Byrne and Shake the Tree by Chiara Bignocchi, Paolo Chiarinotti and Silvia Borando all fit this bill. I have used these books both one and one and in storytime. Yes, you can use them with a group—you just have to be creative on how all the children can do the actions that effect the book. My colleage Jo Schofield (she’s also written for this blog) uses these titles with developmentally disabled adults as well, to great effect. I also used Press Here as part of International Dot Day (look at Peter Reynolds’ webpage for more information). Children love these books and react to them positively…and loudly. I’m always looking for more such interactive titles. Which have you found? Get Out of My Bath! by Britta Teckentrup is fun. I’ve used it in a large-group story time. I’m going to read Stick by Irene Dickson to my kids next week. With “When the Wind Blew” by Pat Hutchins, I ask our young readers to “blow” on each page to turn to the next. Although not designed as an interactive text, it works well! Ooo! I like that idea very much! Thanks!